I really wish I had taken a picture of just the jar here, because this mix, when layered, looks gorgeous. The cookies themselves are lovely! Using a canning funnel, layer the ingredients in a 1 quart canning jar in the order listed. 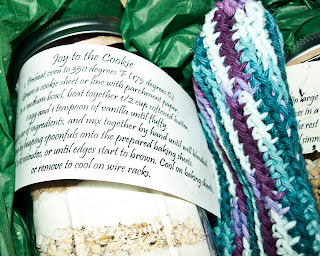 Decorate the jar with cloth, stickers, ribbon or other accessories. Make sure to include the cooking instructions! In medium bowl beat together the ingredients that were not included with the jar until fluffy. Add the contents of the jar and mix together until blended. Drop by heaping spoonfuls onto baking sheets, bake for 8-10 minutes.